Everton catapulted themselves right back into contention for fourth place as they thrashed Arsenal at Goodison Park while Liverpool picked up an anxious away win over West Ham in a game that featured controversial decisions in Sunday's Premier League double-header. The Merseyside teams made significant advances in their respective races for either the title or Champions League football. In the first of two games featured on the Super Sunday schedule, Everton ran riot in an Arsenal decimation at Goodison Park. Arsenal, who have now dropped 10 points out of a possible 12 in their four previous games, were a recipient of Everton's sweet retribution - which saw the Gunners beat them 4 - 1 in the FA Cup Quarterfinal. It would be a much different story to the events that occurred in the Emirates around a month ago, with Steven Naismith altering the course of events early when he pounced on Lukaku's saved shot to hit home. After twenty more minutes of pressing and an uncomfortable spell for the visitors, Romelu Lukaku put his side two goals to the good with a low-fired shot past Szczęsny after dribbling past the watchful Arsenal players. Mikel Arteta - unsurprisingly booed throughout the match - would conceded the third for Arsenal in the form of an own goal after one hour of play. The own goal was forced from terrific work by Kevin Mirallas as he pressurized the Spaniard into the own goal. Another humiliating defeat down Merseyside spells more trouble for Arsenal. #WengerOut hashtags were prominent around Twitter. Frustration is clear for all to see as Arsenal went from battling at the top to fourth in the turn of the new year. Everton made their intentions clear - Champions League football. Coming in with a hot run of form from March, they are going to put Arsenal in a very uncomfortable situation and even jeopardize Arsene Wenger's record of always finishing in the top four. Liverpool survived an anxious onslaught to end the game at Upton Park as they secured a mind-boggling ninth consecutive league win, putting them back at the top of the league after Chelsea topped it with a win over Stoke City the day prior. The majority of the first half was goalless as the hosts kept them at bay and made for a frustrating outing for Liverpool, who had no clear-cut chances in the first half, that was until the late stages. The general consensus of the penalty was blatant, as Luis Suarez's touch was indeed handballed by the defender whom apologized straight after. Then up stepped the skipper, who remained composed as he slotted home with ease. However, Guy Demel would equalize merely minutes later in controversial fashion. Simon Mignolet, who appeared to have been hit in the face by Andy Carroll mid-air, dropped the ball from the cross - falling to Guy Demel to score his first goal for the Hammers. Celebrations were paused for the home side with the linesman flagging. After a hot dispute with the referee, the goal was ruled legal and West Ham had equalized. As the first-half drew to a close in the play after, Liverpool were irate as they argued their cause to the referee. As some called it "poetic justice", Steven Gerrard scored his 50th penalty for the Reds when John Flanagan was taken down by Jaaskaleinen in another controversial ruling. "Two wrongs don't make a right", Sky Sports commentator Martin Tyler described after the event, which lead too a successful penalty scored from the skipper. West Ham's onslaught was insufficient with its goal of equalizing, but it did cause Liverpool a lot of discomfort as they anxiously regained top spot in the league. Controversy no doubt surrounded the West Ham vs. Liverpool fixture. Considering I'm a Liverpool fan I'd rather not comment on the calls to duck accusations of bias. However, that could prove dividend for Liverpool in the title race. I'll just put it as Martin Tyler did, "two wrongs don't make a right". As for Arsenal, it has just been a demise from Premier League contention. The only positive they can take is that they have no tough sides to follow in the run-up to the end of the season, although this does increase pressure on them to get close to maximum points to close out their campaign. Everton, on some hot form right now, are going to really push Arsenal in the challenge for fourth place meaning Wenger will need to get his players attitude sorted. You could see the gulf in contrast between the efforts of both sides. Everton were working their socks off for their gaffer while Wenger's men's attitude were even criticized by Wenger himself. This could be key in the race for fourth. When all things were looking bright, when Arsenal got an incredible headstart to the season, people started to believe. Things have changed so fast that sees them facing more criticism. FA Cup and fourth place is now a must. A terrific Sunday in the Premier League as the Merseyside teams stand tall and have increased the probability of both teams finishing in the top four. GET INVOLVED with your opinions. Should Guy Demel have scored? Did Liverpool deserve the second penalty? Where do Arsenal go from here? Who will go fourth? Use the comments section at the bottom of the article, send us an email, Tweet us your views or post thoughts to our Facbook page. Reports and analysis from the Barclays Premier League action on Sunday 6 April 2014. 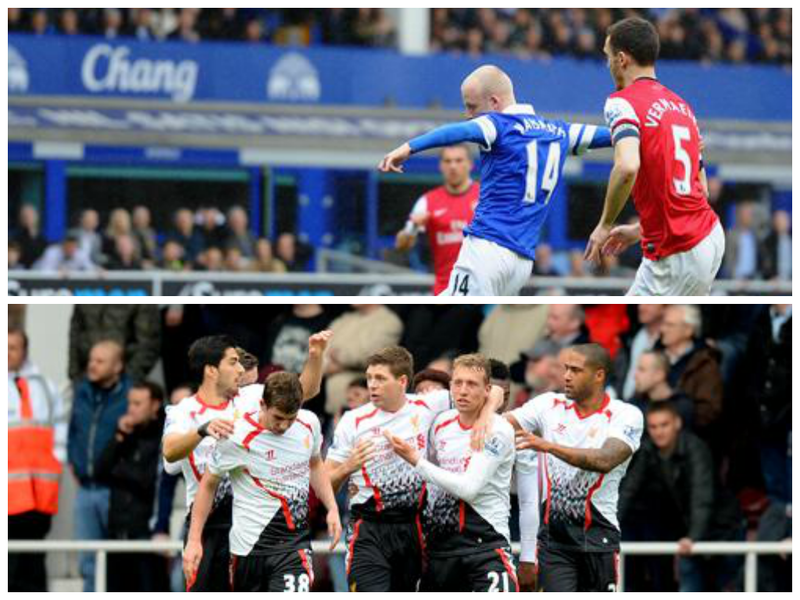 Everton defeated Arsenal 3 - 0 while Liverpool saw off West Ham with a 2 - 1 win.